Incredibily this match served up almost an exact re-run of the fixture four days earlier. About the only departure from the script of the Raith Rovers game was that Hibs got their equaliser when they still had a full compliment of players and before the dismissal of Graeme Mitchell. United's dominance of the opening half was almost total. 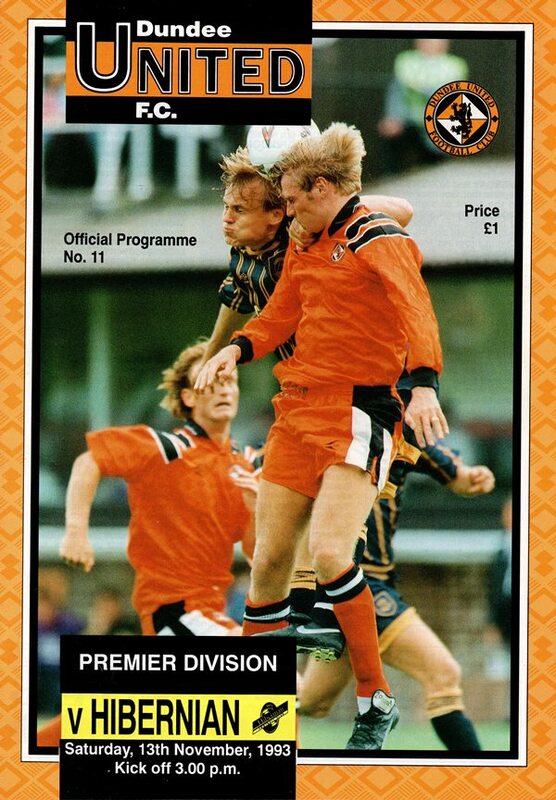 After 18 minutes sustained pressure, the visitor's defence was finally cracked when John O'Neil touched the ball out to Andy McLaren and when his cross came over Craig Brewster sent a glancing header past Jim Leighton which went in at the far post. 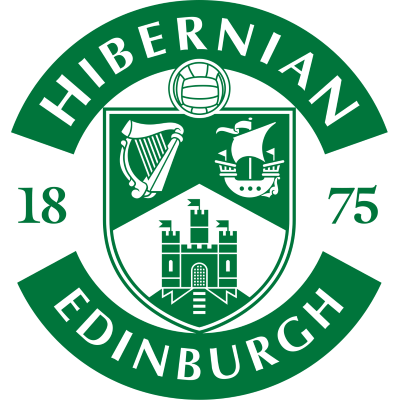 Whilst United remained well on top they failed to really test Leighton, but Hibs only shot of the first half almost brought them a goal as Michael O'Neill sent in a curler from 20 yards which rebounded from the outside of the post. However, right on half-time United got a second goal which should have ensured a sound base for victory. Dave Bowman worked the ball to Billy McKinlay who sidestepped a defender before scoring with a terrific 25 yard shot into the top corner. 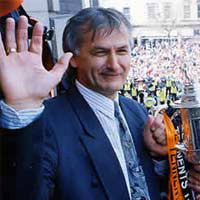 But as against Raith instead of cruising on to victory, the Tangerines lost a goal early in the second period when the comined efforts of two former United men pulled a goal back. Michael O'Neill squared the ball into the middle Keith Wright dummied it and it ran to Darren Jackson who turned the ball home from 12 yards. Even at that only Leighton's agility prevented Christian Dailly from grabbing a third which would surely have put the game beyond Hibs as the Hibs keeper brilliantly turned his downward header away for a corner, Ten minutes from time Hibs repeated Raith's come-back when Tortolano's cross was headed back across the goal by Donald and again Keith Wright let the ball run past him which allowed Brian Hamilton to prod in the equaliser through Alan Main's legs. Mitchell was sent off following a clash with Dave Bowman which earned the United man a yellow card and for the second successive match a two goal lead had been squandered by the loss of two very unprofessional goals to a side which finished up with only ten men! have been conceding all season, whilst few if any of the goals we have scored have come our way as easily. There is simply no way that we should concede goals in the manner we did on Tuesday or even against Hearts the previous Saturday. If you want to be successful in football then you must start from the back and that is why I place so much emphasis on keeping a clean sheet, but instead we continue to lose a series of soft goals. The players have got to take the initiative and help each other with better communication between each other on the park, because I get the impression they simply don't talk to each other judging by the way in which we have been losing goals. The sooner, I can get players in the side who understand what I want, the better, and hopefully we will have taken steps towards bringing fresh faces by the time you are reading this. Despite throwing away points as we have, we still remain only four points off the top of the league and, as we have lost to Hibs on two occasions already this season, I want to see us improve upon what has gone before, but there must first of all be a vast improvement to the defensive aspects of our play against the Premier Division's leading scorers!